MEMPHIS, Tenn. July 16, 2014 – Electrolux today donated 600 air conditioning units to local residents affected by the high summer temperatures as part of its “Keeping Memphis Cool” initiative. The community donation is being coordinated through Neighborhood Christian Centers (NCC) and priority was given to households with seniors 60 and older, disabled residents, those who have been laid off from work or are on medical leave. The donation of state-of-the-art, energy-efficient Frigidaire room air conditioners is valued at almost $90,000 and represents the third “truckload” donation of appliances that Electrolux has provided to Memphis residents. Last October, the company donated $100,000 worth of cooking appliances, and in July 2013 it donated 200 air conditioners valued at nearly $30,000. “We’re glad to continue our investment in the Memphis community, a community that we call home,” said Jack Truong, president and CEO of Electrolux Major Appliances North America. Electrolux, which sells these air conditioning units under its Frigidaire brand, produces cooking products at its recently completed Memphis manufacturing facility. More than 650 people are employed at the plant and 95 percent are local to Memphis. “Our products provide the comforts of home, and it’s important for us to share those comforts with our Memphis neighbors,” Truong said. 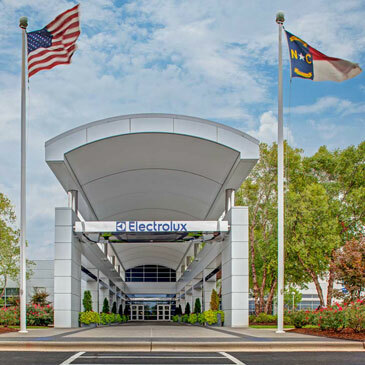 According to NCC CEO and President Ephie Johnson, the assistance from Electrolux comes at a much-needed time. “Neighborhood Christian Centers works year-round to serve our neighbors in need. The donation of air conditioning units by Electrolux could not come at a more critical time as Memphis temperatures are rising and our elderly, disabled and financially disadvantaged neighbors are unable to find relief from the heat. We are so grateful to be able to share this basic necessity to 600 neighbors to ensure that they do not suffer from the heat this summer,” she said. The company also donated nearly 400 air conditioners this week in Charlotte, N.C., where Electrolux North America is headquartered.